What should one do to have normal occlusion? Classical way to improve occlusion consists in using brackets and platters - orthodontic equipment. Teeth are being affected by mechanical pressure on teeth. Orthodontic trainer works according to a different principle. First of all it eliminates the excessive pressure experienced by teeth and jaws. It can help to get rid of bad habits that cause malocclusion and change of the position of teeth. Trainers help to form a denture, stimulate the development of all parts of the jaws. The muscles are getting used to the proper position and it secures a good result unlike all classical methods of correcting occlusion. Psychological aspect of the problem deserves special attention as trainers do not traumatize the childs psychics. Trainer is use for 1 hour during the day and at night while the child is asleep. Unlike trainers, brackets demand constant wearing and will most probably cause physical and psychological problems. Moreover, it is much easier to cure a child with the help of a trainer. Mind that it is also absolutely painless. The best time to start treating your childs teeth is as soon as you see even minor problems with teeth formation (5-8 years). The effectiveness of treatment at an early age is very high and in 90% of cases normal occlusion will be restored. If your child uses a trainer and follows the scheme of application recommended by dentist the possibility that your child will not have to improve occlusion with the help of expensive brackets is rather high. 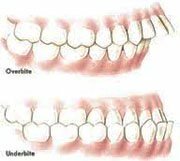 It is much cheaper to cure the teeth at an early age because using brackets to improve occlusion is not a pleasant thing. The dentist will have to make your dental model, send it to the lab to make the system and then adjust it to your teeth. Buying a trainer is 6 times cheaper. The size of the trainer is standard; it can be used by everybody. You may only need to shorten the trainer considering the length of the jaws. The effectiveness of treatment with the help of a trainer largely depends on your childs mood. Try to explain your child how to use a trainer properly. Tell the child that he should not bend or chew the trainer just for fun. It is forbidden to talk while wearing a trainer. Avoid activities when a child is wearing a trainer during a day. Let him do his homework, watch TV or read a book. If you notice that your child has tooth-grinding it is better to buy a harder trainer. Trainers can be used alongside with different orthodontic appliances like brackets. There is a special trainer for brackets to enhance the effect of nonremovable brackets. This way you can protect the soft tissues of the mouth cavity from possible injuries and correct the childs functional habits. It can also correct occlusion abnormalities of different severity. As soon as the doctor removes brackets he can recommend using a retentional trainer to consolidate results of correction. Orthodontology is a field of dentistry dealing with correction of the form of teeth and elimination of malocclusion. Orthodontology is exactly what you need if you want to have a perfect occlusion. The majority of people have malocclusion or their teeth are uneven. Defects of the mouth cavity are numerous: malfunction of the lips and the tongue, irregular shape of the dental arch, different size of the jaws, deglutitive problems. All dental anomalies must be cured. There are many factors that can provoke dental anomalies. If one eats only soft food the jaw will not have to work properly while chewing. Eventually your teeth will grow but the jaw will not. So your teeth may even lack space in the mouth. Still there are anomalies of the opposite quality. The jawbone is too big so spaces between teeth are formed. Uneven teeth and malocclusion are not just a psychological problem. If one does not cure the abovementioned anomalies in time the consequences may be sad. Gum diseases, caries caused by the lack of the mouth cavity hygiene and complications with the temporal-low maxillary joint may develop. The main objectives of orthodontology are the following: face aesthetics, even teeth, proper development of the facial part of the scull, perfect occlusion, beautiful smile, proper functioning of the tongue and the lips, elimination of bad habits, regular breathing.